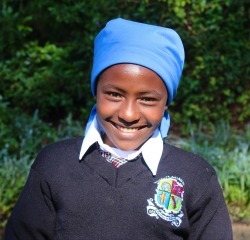 Having left a large family of ten siblings to join boarding school, Beth is thrilled to be a part of the 2019 graduating class at Uhuru Academy. Being deeply moved and feeling merciful for those who are suffering or in pain, she would like to pursue a career in medicine. Christian Religious Education is Beth’s favorite subject taught at Uhuru and she clings to John 4 as Jesus tells a Samaritan woman that she will never thirst again. In her downtime, Beth enjoys reading storybooks and knitting. Click here to sponsor a student like Beth.